Saturday, May 11, departing at 7:30am (7:00am from the subway). In Brief: Hike up on to the ridgeline of the mountains opposite Miaofengshan Temple and make a big 16km loop all the way around, climbing 1,000m-plus on the way. 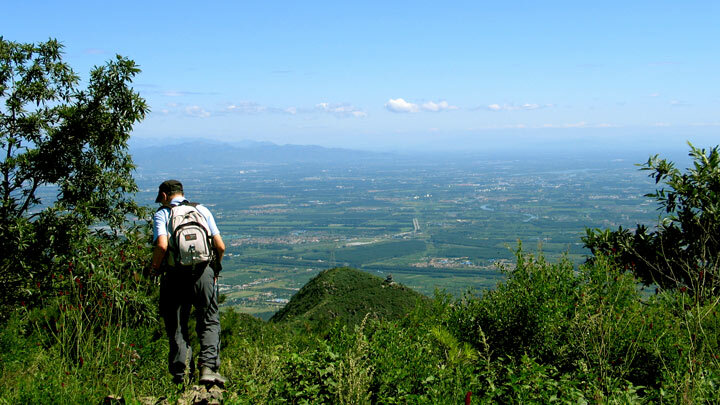 Views of mountains from the Miaofengshan trail. 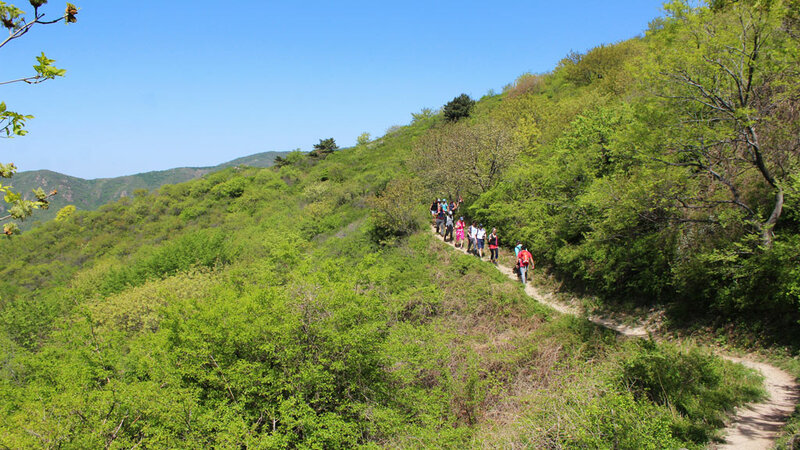 This hike starts from a village close by to Miaofengshan Temple, in Beijing’s West Mountains. We’ll follow part of an old pilgrims’ trail along a ridge with excellent views, up to a plateau, then up and along the Vulture Rock Ridge. At this time of year the scenery should be starting to get nice and green, with flowers starting to bloom. There might also be some extra activity at the temple, as it’s the time of year that there is sometimes a temple fair. From the carpark in the middle of the village we’ll follow the main road up towards their orchards and terraces, turning off to head up a steep and twisting mountainside trail. Halfway up we’ll join one of the many pilgrim trails in the area, a roughly paved path that heads up to a saddle above the village. There’s an easy and open trail across the hillside, with long views of the surrounding mountains. The trail takes us through the hills, then down a valley and through a straggly pine forest, passing the house of the local firewarden boss. The path through the pine forest will take us to a gently rising plateau, where we’ll stop for a snack, rest, and a look around. A trail leads up the plateau and along Vulture Rock Ridge. At first it’s a broad gravelly trail along an old firebreak, which then meets a new road that was built up to the lookout point up top. We’ll follow that road for a little while, and then get back on to hill trails to reach the first peak on the hike, at an altitude of 1,265m. 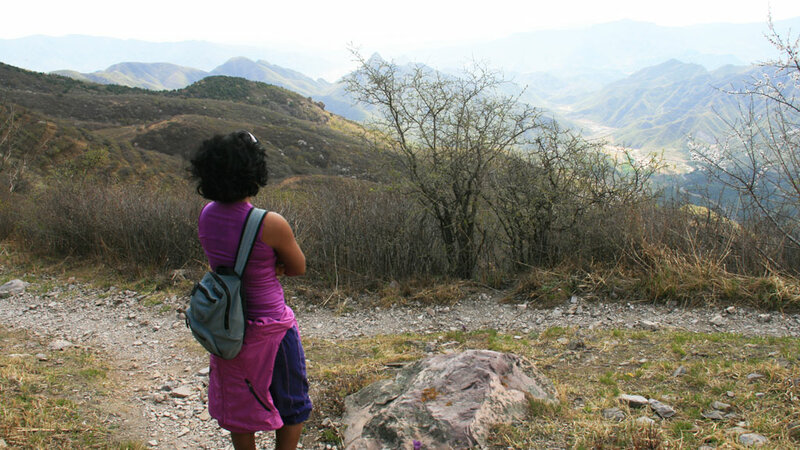 The views are worth the climb – mountains all around, and views of the flat area that is slowly being filled by Beijing’s urban sprawl. 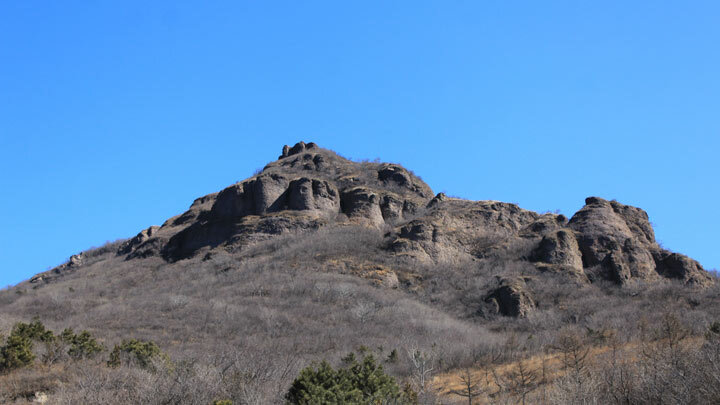 From the peak we continue along the ridge, passing by the tablet that marks the junction of Beijing’s Mentougou, Changping, and Haidian districts. 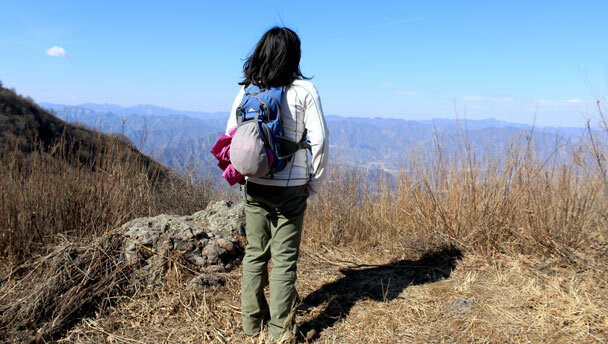 We then make a steep descent and pass the ruins of an old teahouse, and then get back up on to the ridge that will take us up to the peak of Miaofeng Mountain—a steady climb with a few really steep sections that takes us up to 1,277m above sea level. 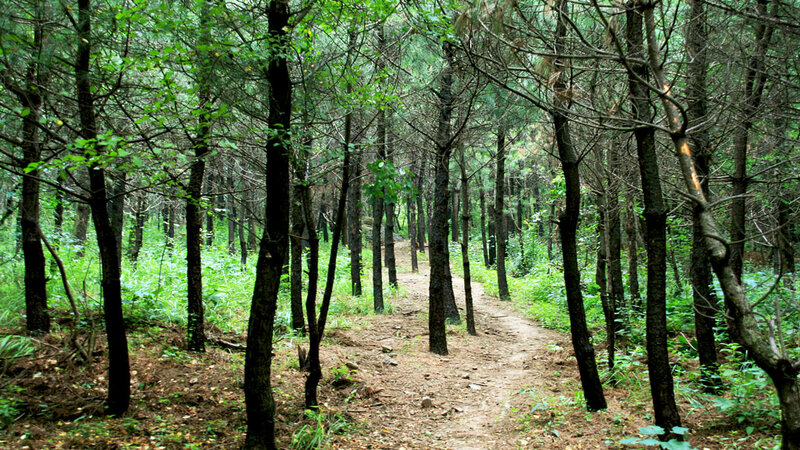 It’s a scenic trail, but can get bushy in summer. We follow a gravel trail down from the peak of Miaofeng Mountain, sneaking through the side of the Miaofengshan temple and then down a paved stairway to finish the loop. There are some big climbs, and will be tough on a hot day. We’re often exposed to strong winds up on the ridge. Parts of the trail will be brushy and scratchy. If you’ve done our Vulture Rock Ridge loop hike, you’ve already been on the first 2/3 of this trail. Sixteen pictures from a fall hike in the mountains around Miaofengshan Temple. 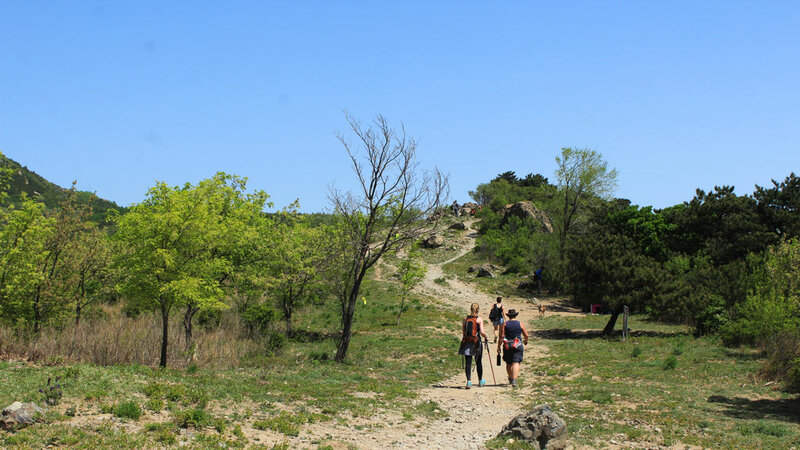 The trail along Vulture Rock Ridge joins two of our other trails, making a nice scenic walk with a lot of uphill. And lots of flowers!